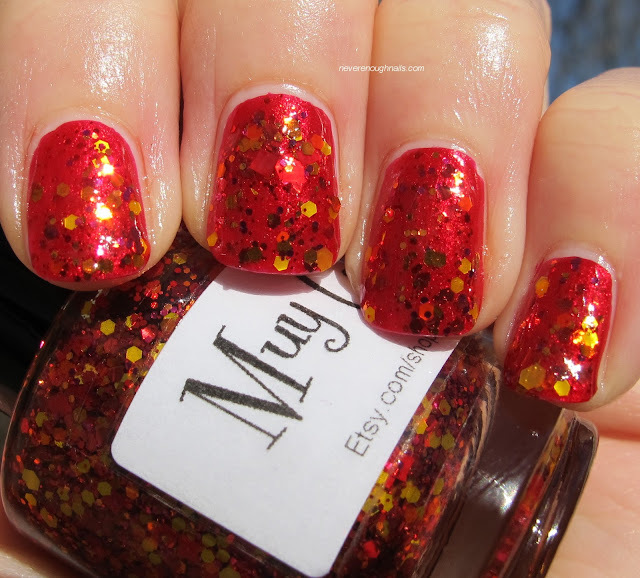 Never Enough Nails: Glimmer by Erica Muy Caliente! 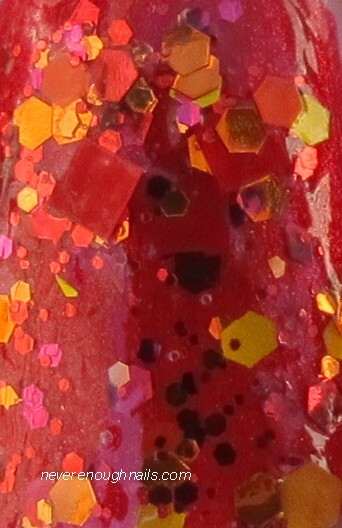 I'm taking a short break from holiday polish today to show you this beauty, Glimmer by Erica Muy Caliente. I love this SO MUCH!!!!! 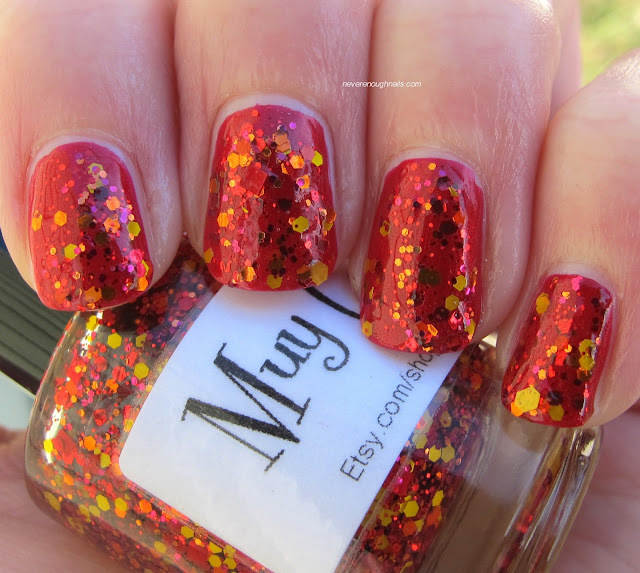 Muy Caliente is a clear base packed with red, orange and YELLOW hex glitter in several sizes, large red square glitter, small magenta hex glitter, tiny red, orange and magenta glitter, and probably about a million other kinds of glitter, all in the hot hues of red, orange, magenta, and yellow. I am super excited about the yellow glitter in Muy Caliente because a lot of indie polish makers don't use yellow very often. I happen to love yellow glitter, and it makes this polish really unique. 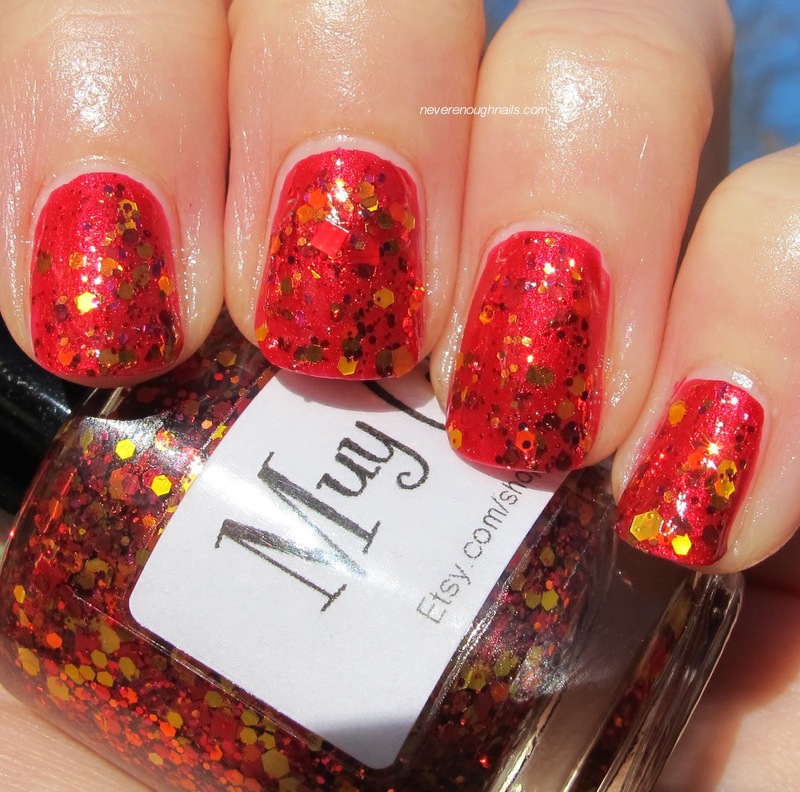 This is two coats of Muy Caliente over two coats of OPI Danke-Shiny Red. Muy Caliente was easy to apply, I just did two regular wiped coats, nothing fancy. All the glitter laid nice and flat, even the large red squares. This is definitely a polish I would wear year round. I think next time I will try it over white. I think it would really pop! Muy Caliente is available now at Glimmer by Erica's Etsy store. She also has some really amazing looking holiday polishes. I have my eye on Boxes and Bows and Winter Wonderland!